Parts of York look much as they did in colonial times, with a downtown area of historic brick buildings and nearby factories, farmers markets, and a large town square which all suggest the city’s importance before and during the Industrial Revolution. With a Harley-Davidson plant and climate-control maker York International, the area has a diverse base of mostly small manufacturers.. The area is strategically located among an array of places providing employment and amenities. The proximity to larger East Coast cities, particularly Baltimore and Washington D.C. south, brings in new residents. Some of these derive income from these larger cities and seek lower living costs and small town living in the York area. Baltimore is closest at 60 miles south. York also sits between historic Gettysburg to the west and the Pennsylvania Dutch country and Philadelphia areas east. Hanover is a small manufacturing and retail center 15 miles southwest. For those willing to travel for certain amenities and services, York has a pleasant small-town feel. The area has mostly rolling hills given to agricultural use with intermittent creek valleys and wooded areas. The hills become larger toward the south. The climate is humid continental, with some influence from mountains to the northwest and water to the southeast. 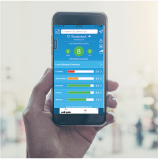 Summers are warm and humid with frequent thunderstorms and an occasional hot spell. While most bitter cold weather avoids the area in winter, there is snow and snow accumulation. First freeze is mid-October, last is late April. The median home price in Red Lion is $132,100. Browse Homes in this Range. 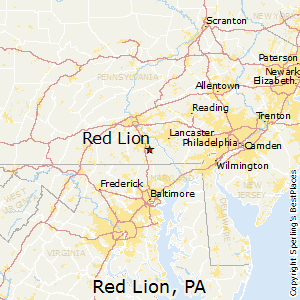 Compare Red Lion, Pennsylvania to any other place in the USA.